Does your desk look like it's made of sticky notes? If so, you may well find a friend in StickySorter. This freebie does far, far more than either paper-based notes or other sticky notes software. 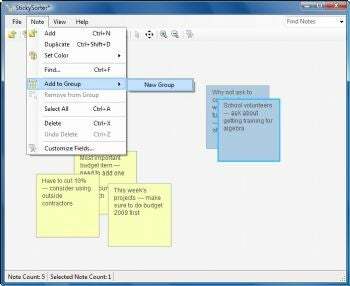 Think of it as a sticky note program on steroids. StickySorter goes far beyond the basics of letting you create sticky notes. You can also put notes into separate groups and color code them, search through all of your notes, create formatted data fields for notes, and arrange them in just about any way you can imagine. It can also import notes from any program that can export data in the .csv format, such as Microsoft Excel or Microsoft Access, by choosing File-->Open, and then navigating to the file you want to open. You can export your notes in that format as well. The program does have one shortcoming: The sticky notes can't be arranged on your PC's desktop, as with some other sticky notes programs. If you're a fan of sticky notes and can live with that, though, you'll find this program a boon. Note that in order to use the program, you'll have to allow StickySorter to send your usage information to Microsoft. Microsoft claims the information will not be used to personally identify you. Still, if that makes you uncomfortable, don't download the program.